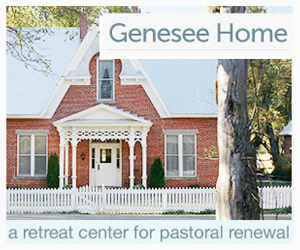 There are some things in life that I’m willing to travel a great distance to overpay for. While the list of things isn’t long, it does include a very special frozen delight, found in only a handful of places in the world. If you’ve never experienced the extreme goodness that is “Dole Whip”, then you my friend are missing out on one of the best parts of a sun-filled vacation. Dole Whip is a pineapple soft serve offered at only two locations outside the Dole Plantation in Oahu; at Disneyland in California and Disney World in Florida. “You think that you’re walking past the line for the Not So “Enchanted Tiki Room”. 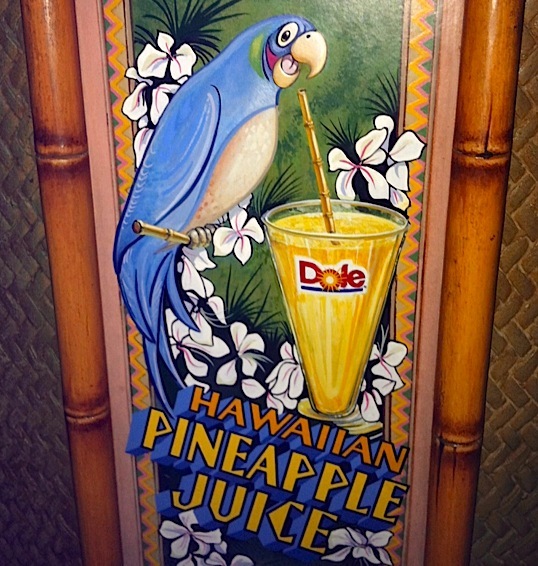 You see, at Disneyland the Dole Whip is located inside the waiting area for the Tiki Room. Since no returning visitor has purposefully gone into the Tiki Room since 1978, the waiting area is usually vacant… except for a long, single-file line that extends from the Dole Whip cash register, out into Adventure Land. It’s an easy mistake to make, when you cross the bridge into Adventure Land you’re usually dead set on getting to the Indiana Jones queue. Since the Tiki Room hasn’t been updated since Magnum PI was on the air, your first instinct is to blow past the area. …because a January gym is a chaotic gym. You see January is the worst month for regular gym attenders because every January many people decide that “getting into shape” is going to be their New Years Resolution. In conjunction with this compunction, many health clubs offer incentives to entice new members to save money by purchasing a yearly membership. Now with all of the new members arriving the Gym doesn’t add more space, equipment, or classes, they simply cram more people into their facility. 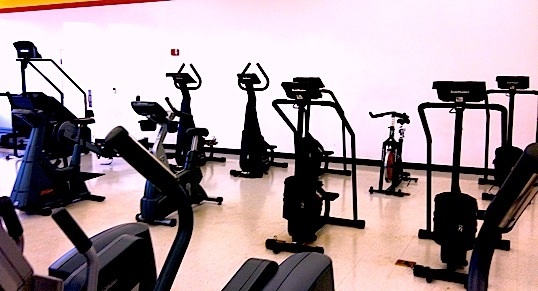 This means that in the exercise area there are increased wait times for equipment, especially for treadmills and ellipticals. It’s much worse in the locker room. While long-term club members generally have well established daily routines built around exercising and showering at the health club, new members are often just figuring out how they are going to fit all of this into their schedule. All of the hurried jockeying for locker and shower position causes the room to become a tightly packed sweatlodge of clammy, half-naked bodies awkwardly bumping into each other. At the gym, January is a month rife with grumpy and complaining members, all unhappy with the club’s services. Many threaten to take their business elsewhere. None of this murmuring ever leads to additions in fact; the club will gladly receive your complaints and do nothing. Because they know that the problem will take care of itself. During a trip to Maui, for my sister’s wedding, I learned that I love to snorkel. When we got to the Island my brother took me to a dive shop where we rented a snorkel set and some fins. 10 minues later we walked out the back of our hotel room, waded into the water together and, aside from the actual wedding, never got out. When I go back into the water, I don’t have to go back into the dive shop anymore, because I own my own gear. I only need someone to go with me. 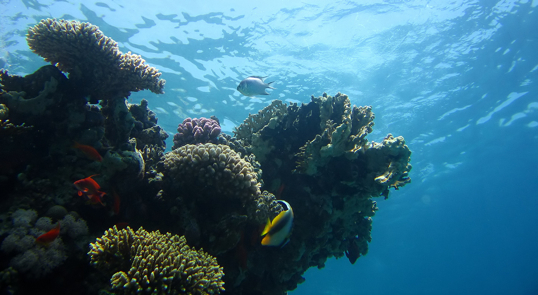 Growing up in California, I had never been snorkeling at the beach because we always went to swim and surf beaches, and the snorkeling is usually not very good in these locations. My only previous snorkeling experience was during an ill advised trip to a theme park. 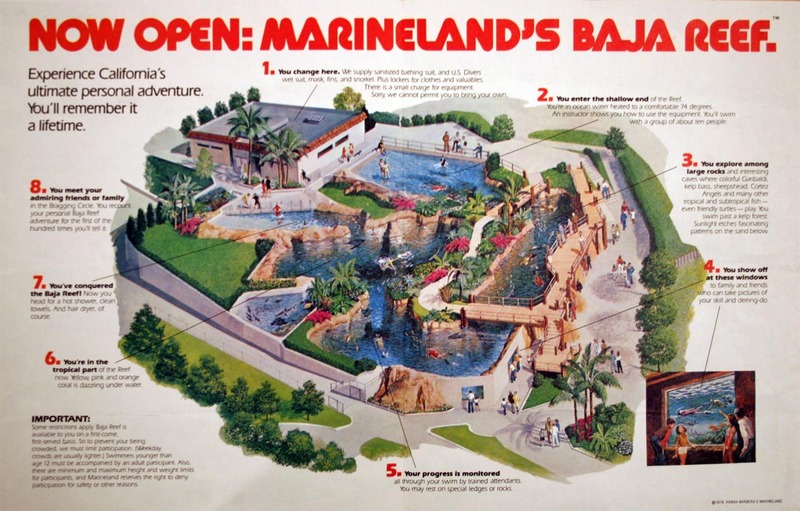 When I was a kid we visited “Marineland of the Pacific” in Palos Verdes. It was California’s first theme park, and it was kind of a pre-Sea World, Sea World. They had dolphin shows and fish exhibits and my favorite part was that Hanna-Barbera sponsored the park. This meant that as you were walking around the park you’d occasionally bump into characters like Mugilla Gorilla, or Quickdraw McGraw. I remember going there with my family and seeing an attraction called “The Baja Reef.” The Baja Reef was the only exhibit in America that allowed guests to actually swim with salt-water fishes from the Pacific Ocean. I begged my parents to let us swim in the reef. I promised to mow as many lawns as it took to repay them for the snorkel rental. To my surprise, they agreed. My Dad and my brother went with me to the rental counter to get our gear. As we did this, we walked past a giant window that looked into the exhibit from under the waterline. As we passed the window I saw something out of the corner of my eye that gave me pause. What I saw scooting past that window looked an awful lot like a shark.